Copper Sinks 101 is a compilation of articles that will help you make the right choice of a copper sink. In Copper Sinks 101 we explain Patina Finishes and how to choose a quality sink. We offer instructions about how to maintain your sink once you have it and explain many other facts that will help you find a sink you’ll love forever. You made the decision to buy a copper sink to complete your kitchen or bathroom décor, but there are so many styles and finishes its difficult sorting quality products from the questionable. Here’s a guide to help you choose a quality copper sink in the style and finish that suits your needs. In any artisan crafted product, quality can vary. There can even be noticeable differences between two items made in the same shop. Consequently, a system of grading copper sinks has arisen, to sort them into categories of quality. Three primary factors determine the quality of copper sinks: copper purity, gauge (thickness), and construction technique. Copper is one of very few elements that is found in essentially pure form in nature. Copper sinks should be made out of 99% pure copper with 1% zinc added for strength and integrity. This is the alloy used for our SoLuna copper sinks. Copper has natural antimicrobial properties, making it ideal for use in the kitchen environment. Copper alloys with lead are sometimes used in sinks made in the Middle East, India and China. Lead has similar workability properties to copper and is quite inexpensive, but it is harmful to humans and should be avoided. Copper is a metal that constantly changes with the environment it is exposed to. When exposed to oxygen, it develops patina or oxidation, as most metals do. The oxidation darkens the raw copper color over a period of time, starting with caramel hues to dark chocolate, and if exposed to salt or various acids, copper will turn green. We recommend that you research the element of copper to fully understand how it reacts with other substances. Due to its elemental nature, copper can be repeatedly recycled, melted down into its pure state and reworked into new products. Here’s an interesting fact about copper: 80% of all the copper ever mined is still in use today. Copper is an eco-friendly and recyclable resource. The thickness of the copper used in the construction of hand hammered copper sinks varies greatly between factories. Copper is a soft metal and the thickness can have a dramatic effect on how well the sink wears over time. This is especially important for kitchen sinks that under a constant barrage of pots, pans, tools and cleaning products. 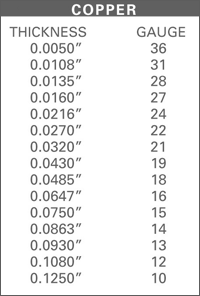 Gauge, a measurement of the thickness of the copper material, is sometimes referred to by the weight per square foot. In copper, the thicker the gauge, the lower the number. Though you’ll find bath sinks made from 20 gauge (the thinnest available) to 16 gauge, most kitchen and farmhouse sinks range from 18 gauge to 14 gauge. When shopping for copper sinks, always ask about the gauge. A thicker gauge sink will be more expensive but in most cases will be well worth the extra cost. A lighter gauge metal can sometimes produce a tinny sound when the faucet is turned on and water drums on the sink surface. For this reason you’ll often find lower quality sinks insulated with foam blocks in an effort to help dampen the sound. Thin, light gauge copper will also dent more easily, which is a big consideration, especially for kitchen farmhouse sinks. 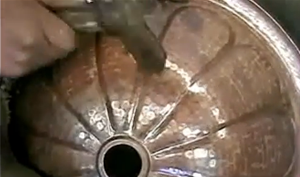 A well-made copper sink should be properly shaped. Though hand hammered products won’t ever be perfectly shaped, they definitely should not be “out of square” or “out of round.” You probably don’t need to carry a carpenter’s square while sink shopping, but avoid any sink that is noticeably misshapen. Such a sink should only be sold as a second. The other major point to watch is the drain hole, which will need to be the correct size to meet code for your application. The position of the drain is a matter of preference. Most homeowners prefer sinks with the drain hole roughly in the center, which easily fits standard installations. Large commercial kitchen sinks often have the drain hole and the faucet off to the side to allow for use of the water at one end while pots and pans awaiting washing are stacked at the other. Copper sinks can be custom made with the drain in the position you require. Regardless of where the drain is placed, the bottom should slope gently toward the drain. Due to their size, copper farmhouse sinks almost always include welded seams, which should be TIG welded using copper rod, (“copper welded”). Copper sinks should not be soldered. Soldered seams will appear gray with time, will eventually leak and could contain lead. Some copper sink retailers like to use jargon that only confuses shoppers. Words like annealed and cold rolled are important to metallurgists, but they have little impact on the construction of copper sinks. These terms are used mainly to refer to the manufacturing process used to create the copper sheets, rather than to making the sink for the buyer. Cold rolled copper is created for uniform thickness and in large continuous rolls. It is used mainly by large domestic producers of commercial kitchen sinks. 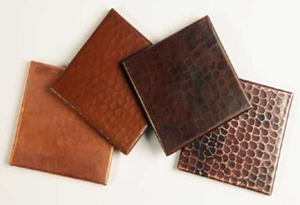 Annealed copper may be less uniform in thickness and typically comes in sheets of a more manageable size for use by artisans who create items with the hand crafted look. Both kinds of copper are perfectly fine for the creation of copper sinks. We bought our competitor's copper sinks and completed an in-house comparison between our SoLuna brand copper farmhouse sink and similar styles from two leading DIY Big Box Stores. The side-by-side comparisons are interesting. You'll be surprised by the results with all the facts. There are two basic styles of copper kitchen sinks, standard kitchen sink style—which can be installed in either an under counter mount or a drop-in mount—and farmhouse sink style. The rustic nature of copper sinks lends itself well to the farmhouse sink style. Sometimes referred to as apron front sinks, farmhouse sinks come in a variety of sizes, shapes and in different configurations—i.e. single well, double well and even triple well versions. Bathroom sinks are generally available in three styles: vessel, drop-in or under counter mount. Under counter mount and drop in are essentially the same style, often differing only in the finish applied at the rim or lip area. A drop in version may have a border of décorative detailing, while an under counter mount will usually be completely flat. Be sure to order the proper lip style to accommodate your bathroom décor project. Working with a copper sink company that offers custom sinks will open up a world of possibilities. A company that has a direct relationship with the artisans can help you get exactly the options you need in your copper kitchen or copper bath sink. Surfaces—Which is Best, Smooth or Hammered? When deciding between a sink with a smooth finish and one with a hammered finish there are two things to keep in mind. The first is your style preference. A smooth finished sink usually has a modernist or contemporary styling. A hammered sink has a warm, hand-crafted appeal that fits well in rustic, ethnic, western or traditional décor. Next, think about your lifestyle. Will the sink receive a lot of love from children, or be heavily used by enthusiastic cooks? A smooth surface copper sink will be more difficult to maintain in a busy residential kitchen and will show finger prints and scratches more readily than the more forgiving hammered surface. Washing dishes, bumps from pots and pans, etc. can mar a smooth surface in no time. This isn’t a problem in a commercial kitchen where only function matters. But in the home setting, looks are much more important. In addition, hammered surfaces are harder than smooth surfaces and hold up better in the demanding kitchen environment, but in the bathroom a smooth surface copper sink with contemporary styling can be exactly the right choice. Copper sinks often come in various finishes ranging from the bright, raw copper of a shiny new penny, to a dark chocolate or espresso color, which is patina that develops naturally over time. The copper finish you choose is a matter of personal taste and your chosen kitchen or bathroom décor, but a darker patina allows you to avoid the upkeep associated with shiny copper. Copper Sinks Online offers four finish choices. A copper finish is a “living finish” and never stops changing color. The patina change will be most noticeable in kitchen sinks, which regularly come in contact with acidic or salty foods . The rich highlights and undertones of the patina process are constantly evolving. 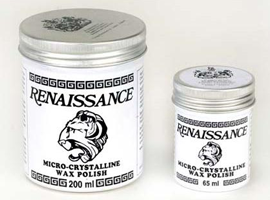 You can greatly reduce this change with the regular application of protective coating of Renaissance Wax. Patina can lighten too. Copper reacts to acidic foods, very salty water from ice cream making and certain chemicals. When these substances are left sitting on the sink’s surface the patina will lighten. Lightening of the patina doesn’t damage the sink at all, and the patina will darken again with time. To reduce the chance of accidental lightening a copper sink can be waxed. Another quality factor to consider in your copper sink purchase is the process used to create the darker patinas. In some countries, harmful and caustic chemicals are used. The widely accepted method for sinks made in Mexico and the US utilizes heat, paired with safe, reactive agents. A lacquer is sometimes used to protect the surface of a copper sink and keep it from forming a natural patina. Generally speaking, most people will prefer a non-lacquered sink, as this allows the sink to patina evenly and naturally. Lacquer finish is not generally recommended on kitchen or bar sinks as it will quickly scratch off under the heavy use those sinks are subjected to. Lacquer is more acceptable for bathroom sinks, especially those that are highly décorative, or plated with nickel, brass or silver. Better though, if you want to slow down the patina process of your copper sink, is to rely on applications of a wax such as Renaissance Wax, which protects your sink’s finish in much the same fashion that car wax protects your car’s paint. Applied every few weeks, the wax will provide a barrier between the copper and the environment and will help protect the copper finish you have chosen. The company you are buying from should offer a warranty against defects and stand behind their product. Many less expensive copper sinks are sold on popular auction web sites without such protection. However, quality copper sinks are also sold this way so always look for the vendor’s warranty. In general with any auction, you’ll do well to remember the old sayings “buyer beware” and “you get what you pay for.” If a copper sink seems unbelievably cheap there is usually a reason. If something goes wrong with your copper sink, or should there be a problem when it arrives, you want to make sure the company you purchased from will stand behind their product. A reputable dealer will provide their shipping location, clearly state their warranty and return policies and be available for consultation. Created to provide the trade and homeowners access to some of the best copper products available anywhere, SoLuna offers copper sinks made by artists who care about their craft. The result is the largest selection of high quality and custom crafted copper kitchen and bathroom sinks available. 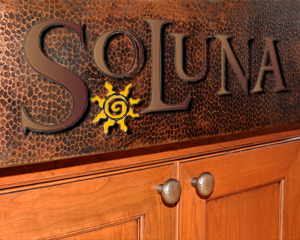 All SoLuna products and artists are hand-picked by the principals of CopperSinksOnline.com for quality, reputation, integrity and great design. We’re proud to offer our customers the opportunity to bring a unique work of art into their lives at an affordable price. We hope that one of our sinks will help you complete the perfect kitchen or bathroom décor project. SoLuna’s artisans live and work in Santa Clara del Cobre, a region of Mexico long celebrated for the skill of its copper smiths. Our artisans work with only the highest quality and thickest gauge material, copper that is at least 99% pure, with only a small percentage of zinc added for stability. Our customers can rest assured that our genuine hand hammered copper sinks from Mexico are not made with any lead containing alloys. SoLuna copper sinks are made from pure, reclaimed copper which has been melted down to its natural elemental state—any impurities are removed. The copper is then formed into metal sheets which are fashioned into beautiful sinks. At Copper Sinks Online, we offer no seconds—only first quality copper kitchen and bathroom sinks that have passed our rigorous inspection program. We recognize that this might mean a potential price difference, but we prefer to protect our reputation by shipping only products we would be proud to install in our own homes. Although it costs more, we make our sinks using only the thickest gauge copper available. Our kitchen sinks do not need sound insulation because they are not made from the thinner gauge copper we see being sold by some of our competitors. If you have any other questions before you purchase your copper kitchen or bathroom sinks, feel free to give us a call at 1.360-321-2131. We will be happy to provide any other copper sink information you need to make the best choice of copper sink for your family. CopperSinksOnline.com was created to provide the trade and homeowners access to some of the best copper products available worldwide made by artists who care about their craft. The result is the largest selection of high quality and custom crafted copper work available. If you are looking for quality products that are unique and beautiful, or want something custom made for you by true artisans, you have found the right company. All products and artists have been hand picked by the principals of CopperSinksOnline.com for quality, reputation, integrity and design. We hope that our products will help you complete the perfect kitchen, bath or bar. Copper is man’s oldest metal, with use dating back more than 10,000 years. 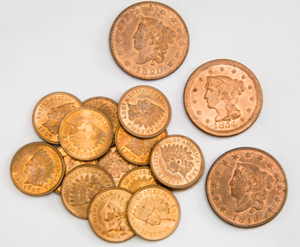 Copper forms many of our most familiar objects, including coins, statuary and cooking implements. Its use in the home in modern times ranges from copper tubing in your plumbing system, to some of the finest cookware available. Restaurateurs, hoteliers and interior designers look to copper and brass as naturally inviting metals that make a statement of quality, comfort and beauty. Copper artisans are part of every culture, but the artisans of Mexico especially have gained a reputation for copper sink making. The term “hand hammered” is used to distinguish sinks made one by one, by hand, in small artisan shops, from those mass produced by machine. These sinks usually have a hand hammered texture that gives them a rustic, rugged, yet thoroughly elegant look and makes each sink truly unique. The hammered texture gives character and beauty, but also strengthens the surface and helps camouflage any small marks that occur with everyday use. 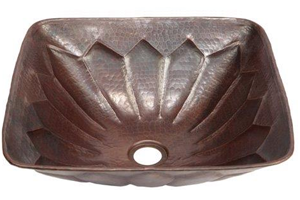 Artisan made copper sinks from SoLuna add a wonderful style on any kitchen or bathroom décor. Most copper sink fabricators in the US focus primarily on commercial projects such as large restaurant kitchen sinks. These are made with smooth rather than hammered finish in standardized, factory produced rectangular shapes. But these cannot compare with the hand crafted beauty of a true artisan made copper sink.